Preheat the oven to 350 F. Line a 15 1/2" x 10 1/2" jelly-roll pan with parchment paper and spray with non-stick baking spray. In the bowl of a stand mixer fitted with the whisk attachment, combine the sugar, flour, cocoa, espresso powder, baking powder, baking soda, and salt at medium speed until blended. In a separate bowl, whisk together the eggs, milk, oil, and vanilla. With the mixer on medium speed, gradually add the egg mixture to the flour mixture, about 5 minutes. Reduce the speed to low and pour in the hot water; mix until blended. Scrape down the sides of the bowl with a rubber spatula and blend again. Pour the batter into the prepared pan and bake until a toothpick comes out of the center clean, about 20-25 minutes. Transfer pan to a wire rack to cool completely. In a clean bowl of a stand mixer fitted with a clean whisk attachment, beat yolks at medium speed until they become light and lemony in color and ribbons form when the whisk is lifted, about 5 minutes. Meanwhile, in a small saucepan, combine the sugar and water. Cook over medium-low heat, swirling pan occasionally, until the sugar completely dissolves and the syrup comes just to a boil. Increase the heat to high and boil syrup until it registers 238 F on a candy thermometer. With the mixer on medium speed, carefully add the hot syrup to the egg yolks in a thin, steady stream. Beat the mixture until it cools to room temperature and is light and fluffy, about 10 minutes. Gradually add the butter a tablespoon at a time until completely incorporated. In a small bowl, dissolve the espresso powder in the Kahlùa (or water); beat into the buttercream. Invert cake onto a large wire rack and peel off the parchment paper. Invert cake again onto a large cutting board. With a serrated knife, cut the cake equally into thirds. Set a large wire rack over a baking sheet (this will collect the poured ganache). Arrange one cake layer on rack; spread half the buttercream evenly over top. Add another cake layer and spread remaining buttercream on top. Place the remaining cake layer over buttercream. Place the cake in the refrigerator for at least 30 minutes to set and chill slightly. Meanwhile, in a large bowl, combine the chocolate and butter. In a small saucepan, heat cream and sugar over medium-high heat, stirring occasionally until small bubbles appear around the edge of the pan. Pour the hot cream mixture of the chocolate and butter; stir until the mixture is completely melted and smooth. Cool, stirring occasionally, until it is thickened and cooled, but not pasty, about 20 minutes. Remove the cake from the refrigerator and pour the ganache over the top of the cake, spreading with an off-set spatula so it coats the sides. If ganache does not cover the sides completely, pour any excess that has collected on the baking sheet back into the bowl and spread again. Refrigerate the cake until the ganache sets, at least 1 hour. Using two large spatulas, carefully transfer the cake onto a serving platter. Leftover cake can be stored in the refrigerator, covered for up to five days. Set the cake out at room temperature for 30 minutes before serving. Enjoy! Such a beautiful cake and your description is mouthwatering! Just PERFECT!!! !I wish you a nice weekend!!! 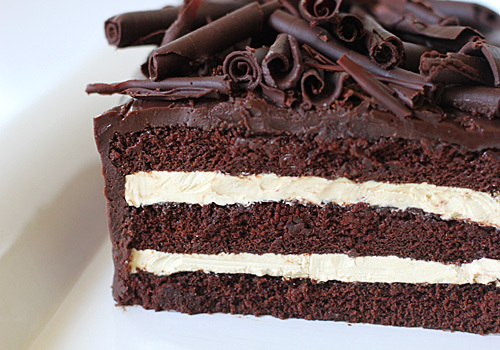 That looks so good...truly the ultimate chocolate temptation.Keep up the good work! That looks AMAZING!!! 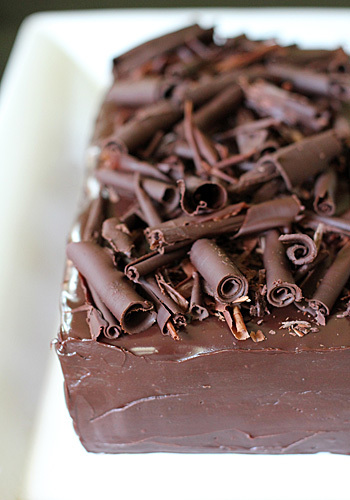 Always on the lookout for more chocolate cake recipes!! New reader here with a silly question. For the espresso powder, do you mean the instant kind or just very finely ground coffee? Thanks! Not a silly question. I use instant espresso powder; Medaglia D'oro to be specific. It is really good concentrated espresso powder, but you can add or subtract according to your own taste. Best! I can't find expresso powder, so can I use instant coffee? I made this today, and although it didn't look as beautiful as yours, the taste was amazing! Thanks for sharing! So pleased you enjoyed the cake! OH MY...looks awesome! Found you on Pinterest! We'd love for you to come over to our newest link party over at The Inspiration Network: DELISH- a desserts only link party. Bring your desserts and let's party!! Made this today and it is so so good! Great recipe!